Tucked away in the northwest corner of Spain, Basque Country not only boasts more Michelin-starred restaurants per capita than any other region in the world, but its unique confluence of mountain and sea, values and tradition, informs every bite of its soulful cuisine, from pintxos to accompany a glass of wine to the elbows-on-the-table meals served in its legendary eating clubs. Yet Basque Country is more than a little inaccessible - shielded by a unique language and a distinct culture, it’s an enigma to most outsiders. Until now. 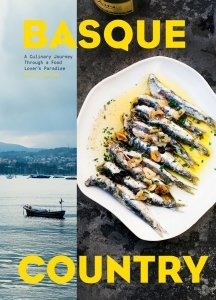 Marti Buckley, an American chef, journalist, and passionate Basque transplant, unlocks the mysteries of this culinary world by bringing together its intensely ingredient-driven recipes with stories of Basque customs and the Basque kitchen, and vivid photographs of both food and place. And surprise: this is food we both want to eat and can easily make. It’s not about exotic ingredients or flashy techniques. It’s about mind-set - how to start with that just-right fish or cut of meat or peak-of-ripeness tomato and coax forth its inherent depth of flavour. It’s the marriage of simplicity and refinement, and the joy of cooking for family and friends.